I don't know what these stunners are called but they seem to grow in low wet areas. We went for a little exploratory drive and found ourselves at the nearby casino. We each had a $5 slot machine coupon. That didn't take long. Lunch was the only successful part of our visit. Darn. 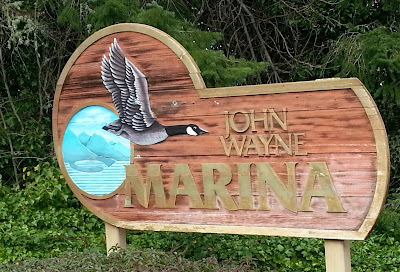 In 1975 John Wayne donated 22 acres of pristine Sequim Bay land on which to build a marina. He was a frequent visitor aboard the family yacht, the "Wild Goose." There is a collection of memorabilia on display to remind us what a cool guy he was. and worth every step through the forest. I'm going to skip the thousand words and let you look at the pictures in peace. Do you know the way to Neah Bay? Friday we drove along the tippy-top of the Olympic Peninsula. I can see Canada from here! 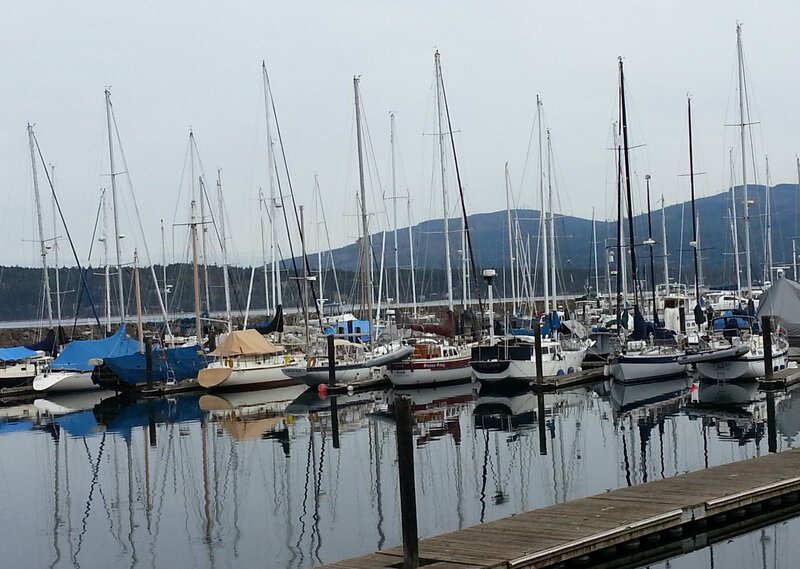 That is Vancouver Island across the bay. Spanish explorers landed in Neah Bay in 1791 and today it is home to the Makah Indian Reservation and headquarters. Tons of fish come from this region, including ling cod, sea bass and salmon, but it is mostly known for the best halibut in the lower 48 states. Our timing was good because the sun shone all day. They get an average rainfall of 110 inches. That's over 9 feet! Fill your living room with water and see how you like it. Look what Al's sisters sent as his belated 70th birthday gift! He calls it "a bobblehead for a bubblehead." We've just been doing ordinary things, settling into life on the Olympic Peninsula. Last night we went to a concert of the Port Angeles High School string orchestra, before they go to New York to perform at Carnegie Hall on Sunday. Amazing how many kids are interested in music. And how good they are. And how many hours the parents have to listen to the practice, practice, practice. but wouldn't trade any of them for our very own Home Sweet Homer. Jack (Amery High School '66) and Jeni. but stubbornly refused to have a good picture taken. Darn. First stop was the Sequim library where Al has a temporary card. Homer got a clean bill of health, a couple of tiny problems were fixed and now we're back in the RV park, resettled and snug. Neither of us have any right to be hungry, but it's time for dinner. That dinner right next door is a place we haven't tried yet . . . . .
Where does that hour go?